Today’s post is about experiences attending Pagan Pride festivals and why they are good for businesses and for personal growth and development as Pagans, witches, Wiccans, or spiritual people. The photos on this post were taken at a Pagan Pride Day event in my State where this shop is located. There are three events in my state. This year I attended two as a vendor and one in spirit. The top four photos of this post are of the table we had at Eastern Maine Pagan Pride Day. Three of the photos are the table we had and the fourth photo is one of our shops members doing a leather working demonstration for children. Yes the girl in the photo behind the table with all the herb and incense materials for sale I myself the shop owner and voice behind the Mystic Echoes Blog and web presences. The bottom three photos are the offering we left for the raffle. The raffle offering consisted of a perfect sample of the products offered by Mystic Echoes. The pouch was handcrafted by my business partner (shown doing the leather demonstration). Inside the pouch was a set of the magical tinctures we carry in store. Finally the herbs and incense packets represented the other products offered here. As you can see there were many different vendors set up around me during the day at Eastern Maine Pagan pride day. For pagans these events provide a basically one day shopping meet. At typical Pagan Pride Day events you can find any item you may need in magic or ritual. You can also find gifts and natural medicines and products. 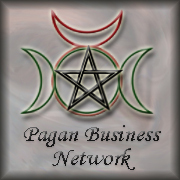 Spending time in the vendors hall and seeing the types of products, services, and businesses that are run by, owned, and supported by Pagans is a way of showing just how vast the different products and services offered by Pagans are. Many times vendors will also be running workshops. This is one of the other main reasons every one should try and visit a local Pagan pride day event. It actually touches on the main reason why we have Pagan Pride Day events. Pagan pride day events are here to serve as educational events. These days and events serve as a place where the general public which may have little to no knowledge of Paganism or Witchcraft can get insight into the various beliefs and practices of Pagan religions. The workshops that occur at these Pagan pride day events is the main way that the public gets educated about pagan beliefs and practices. Often times early in the day the first workshop is a basic introduction to pagan beliefs and practices. Other workshops may be about specific traditions or rites in various traditions. There will be basically workshops on basically any topic you can think of within the realm of Pagan practices. Aside from providing an educational event there is one requirement that all nationally sponsored Pagan Pride day celebrations include. That one thing is a harvest ritual or a group ritual of some form. This is educational but also forms a focal worship point for the day. The harvest ritual is basically there to show worship from a Pagan perspective. While each group is allowed to perform the ritual how they would like, essentially the theme is harvest as these events take place in the harvest season (August-end of October). Finally the last reason to attend Pagan pride events is simply for networking and socialization. I have personally met many different people from across my region at these events. Some of them have become great friends and allies. Other have become mentors and teachers. You never know who you are going to meet and encounter at these events so it is always worth a visit. I hope I have inspired you to check out your local Pagan Pride event. If you are wondering where to look for your pagan pride festival there are a few websites for you to check out. Posted on October 15, 2013, in Pagan Events and tagged Pagan, Paganpride, paganritual, wicca, Witchcraft. Bookmark the permalink. Leave a comment.